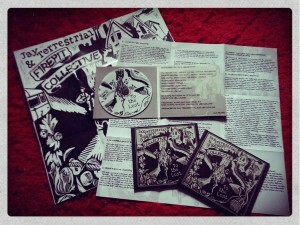 Firepit Collective’s To the Lost: folk songs and landscape punks | Unofficial Britain. 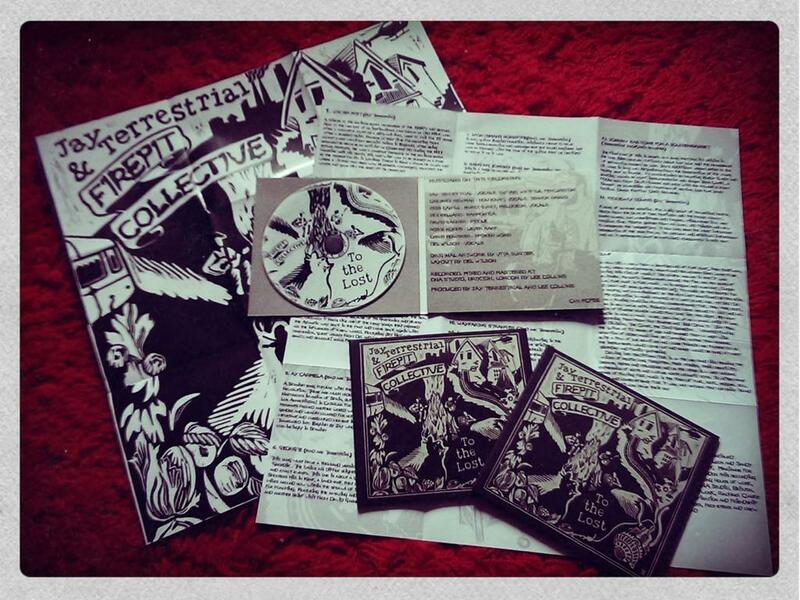 The tail end of 2014 saw the release of the debut studio album from Firepit Collective, the folk band formed by Jay Terrestrial, lead singer of legendary UK punk/dub/ska band the Inner Terrestrials who have been a firm fixture at squat parties, free festivals, and sweaty pubs across the UK for two decades now. They are very good and you should go and listen to them. What kind of music are we talking about then? Folk music, sure, but that’s a nebulous term at best. We’re talking mainly British folk music, but the record includes Appalachian songs from North America, Spain, Italy as well as many British traditionals and original songs that, unsurprisingly, don’t sound at all out of place – the only difference being they are slightly more contemporary in their concerns and political in a way fitting people with links to the anarcho-punk scene. Why is it inevitable that people from the assorted tribes of Britain’s alternative cultures – hammered down by hostile legislation and perhaps not as strong as it once was, but still very much there – start playing folk music? It’s not much of a mental stretch to reach the conclusion that be it rave, reggae, gypsy, folk, country, punk, oi, ska or hip-hop, it’s all music from the bottom up; people’s music that often exists and persists, is (or was) performed and danced to in in-between places. Of course, every single one of these genres has been packaged, commodified and sold to a wider audience in various watered-down forms for a long time now. Every single one of these genres has its fair share of commercial crap and artists you could define as a ‘sell-out’. This, I would argue, doesn’t matter that much. The core remains intact. The term folk, in a British sense at least, is just as likely to conjure up visions of groups such as nu-folkies like Mumford & Sons (who I have nothing against really, but it doesn’t do much for me) as it would Ewan MacColl, The Levellers or Fairport Convention (all of whom I like very much). I’ll concede that the term should be open to interpretation; it’s just that my version of folk doesn’t include faux-rural strumming used on adverts to sell smartphones. I’ll give you my opinion- punk and reggae are folk music, grass roots music by the people for the people. As for radical? It’s not necessarily so, I enjoy a good ballad and we’ve all seen babies dance to it haven’t we? It would be true to say a lot of folk music has been radical. For example in the 20th century, a lot of artists were outspoken in their fight against militarism, racism, sexism and other forms of oppression. There have also been themes of resistance, revolution, paganism and cultural taboos throughout the ages when meanings often had to be hidden to avoid the wrath of the church and state. That said that there’s some very nationalistic trouser swinging stuff out there as well as the leftfield and revolutionary. The links to the world of the hippies, crusties and travellers were there in the British punk scene from fairly early on. Perhaps, as the liner notes say, it was inevitable. As soon as the first, largely apolitical wave of punk had passed and their slogans had been taken seriously by the anarcho-punks of the early 80s, who put them into some sort of action, the links between this new branch of people’s music with older folk traditions of the British Isles soon began to make themselves clear. An obvious example that most would be able to recognise are The Pogues, mixing trad. Irish folk with the energy and attitude of London punk. Post-punk bands like New Model Army started to mix in folk elements of albums like Thunder and Consolation. Billy Bragg sang songs about the Diggers (‘World Turned Upside Down’) making attempts to link the politicised bands of the 80s with the radical currents of the English Civil War (Levellers, Diggers, Ranters and so on). Further underground, the early 80s saw the formation of a number of key bands (following in the wake of Crass) who started cementing links between the punk movement and animal rights issues, folk culture, the New Age traveller movement, squatting, neo-paganism and what I’ll call ‘landscape politics’. Jay explains, ‘My parents were into festivals, I used to go to them as a toddler. I remember a squat in Kirkdale my dad’s band used to rehearse in and I used to go with him, I can remember my baby brother in the rehearsal room in his pram. The alternative scene has always been a part of my life because of the culture around me growing up. I started squatting going to festivals, parties and gigs as a young teenager, travellers were always part of it, especially the free festivals. There has always been a crossover of squatters/travellers particularly among those who are looking for alternatives to the given hierarchy. All around Europe there are still squatted buildings with sites attached to them, the distinction isn’t massive though there are sometimes differences. The main difference is that many travellers make a living on the road. For me it’s with music and occasionally other bits of work when need arises, for others it’s with seasonal work – daffodils in early spring, crewing and performing at festivals in summer, apples in the autumn etc. A lot of us spend a good six months of the year on the road then find other bits of work and site up somewhere quiet for the winter. One of the best (and most notorious) anarcho-punk bands, Conflict, were the first band to really address the issue of animal rights (and the knock-on issues of the class and privilege of those engaged in destructive hunting and food production practises). Bands like The Mob, more anarcho-post-punk than anything, were strongly involved in the squat scene of London (especially Hackney) in the early 80s along with groups like Zounds and Blythe Power, before drifting into the world of the New Age Travellers. 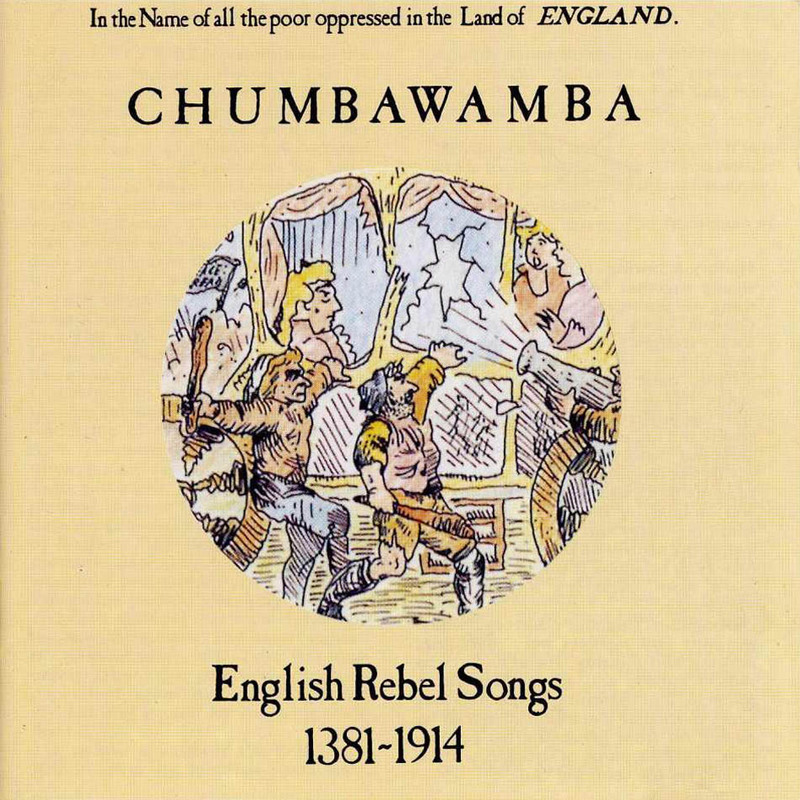 Chumbawamba, who are correctly regarded as being pretty rubbish, started life as an anarcho-band (who actually had one or two good songs) and even recorded an a capella LP of English rebel songs from across the centuries, on the aptly titled English Rebel Songs 1381 – 1984, featuring versions of songs dating from the Peasants’ Revolt like ‘The Cutty Wren’, ‘The Diggers’ Song’ and ‘World Turned Upside Down’ from the English Civil War period, all the way up to ‘Coal Not Dole’ from the, then recent, miners’ strike. The most important band to come from this period in regards to landscape punk (a genre that I’m making up right now) is the Scottish band Oi Polloi, who started life as big fans of the street punk sound popularised by the Cockney Rejects and Blitz, before taking that sound and approach and melding it with Earth First! style-politics and eco-issues, eventually ending up giving up English altogether and singing primarily in Scots Gaelic. 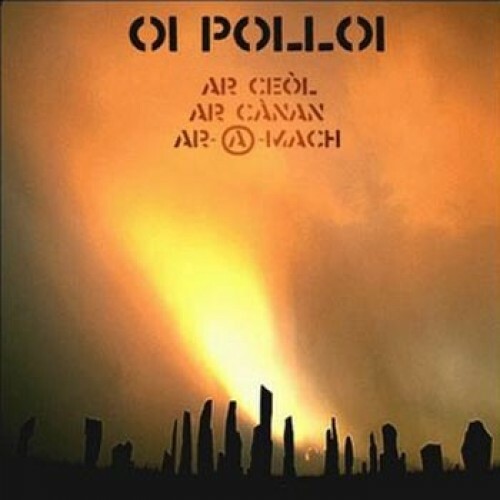 They are also, to my knowledge, the only progressive anarcho-hippy-oi band to sing a punk song in Gaelic about the LINUX operating system. The list of Oi Polloi songs dealing with British landscape politics and a kind of crusty psychogeography is a long one; ‘Take Back the Land’, ‘Terra-ist’, ‘The Earth is Our Mother’, ‘No More Roads’, ‘Thin Green Line’, ‘Free the Henge’ and many more, ranging from the excellent to the mildly embarrassing. Their LPs are adorned with the kind of Celtic-hippy imagery that you’d expect to find at a Rainbow Gathering, not on the t-shirts and jackets of punks and skinheads. I myself have an Oi Polloi ‘In Defence of Our Earth’ tattoo on my left shoulder, complete with lithe earth-spirits holding a banner. It embarrasses my girlfriend terribly. It was through listening to them I first learned about the Highland Clearances in Scotland in the nineteenth century and about minority-language issues the world over. So back to the new Firepit Collective record. It’s clear that a bunch of punks, ravers and hippies playing traditional folk music is not really unusual at all; the links are obvious – it’s inevitable. To the Lost is a fantastic record, and a must for anyone interested in punk, folk and Britain’s radical cultures. The traditional songs on the record include ‘Georgie’, about a gypsy lad on Shooters Hill in Kent, the sea shanty ‘Hanging Johnny’, ‘Durhamericana Set’ (an excellent pun) which mixes reels from the north of England with American bluegrass, and a reworking of ‘Johnny Has Gone For a Soldier’, with added verses about the wars in Iraq and Afghanistan, and topped off with a poem from Chris Bowsher of anarcho-dub legends Radical Dance Faction (in case the links between sub-genres needed one further hammering home). 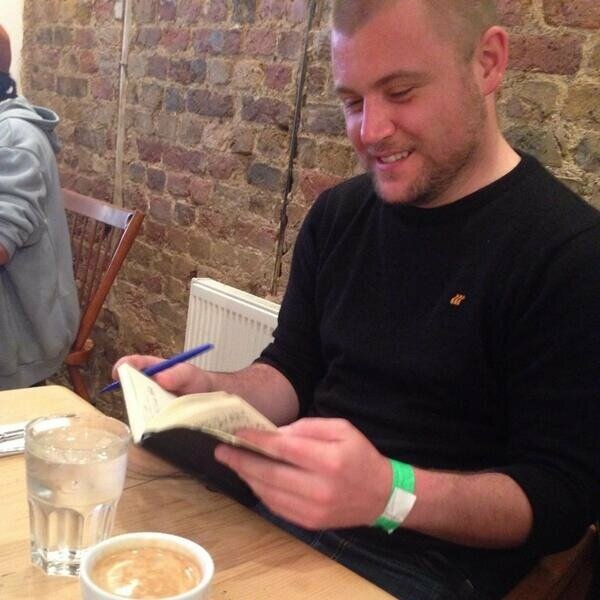 I asked Jay about the selection process – what traditional songs to use and why? The traditional songs on the album are ones I have been singing for a good while, many years in some cases… there is a huge amount of material out there and I have always been selective about the ones I choose to play, I avoid singing songs that i feel are nationalist, sycophantic towards royalty and the aristocracy or that glorify war for example (there are far too many that fit into those categories!) It’s an impossible task to re-live the process that led to this point through all the decades, but I’ll try and explain something about it . . . Artists that had trad folk in their sound like Led Zeppelin and Dylan were an influence from early days but I remember really taking notice when I heard Traffic’s version of ‘John Barleycorn Must Die’ at around 14 or 15 years old, I realised there were depths to it that spoke to me, pre-Christian origins even. It started me wondering about the bardic path, the oral tradition, the stories passed along until the names of the authors are long forgotten. Occasionally I go through periods of researching songs and tunes, sometimes inspired by a version I’ve heard, sometimes discovered in books and manuscripts or in rare cases stumbled upon on the internet. Basically as I said in the sleeve notes of the new album it’s partly an expression of roots and culture North Atlantic style but mainly it’s about playing music we like to play. And why the Spanish, Italian and Appalachian songs? They’re great songs! The Italian song ‘Bella Ciao’ is an anti-fascist anthem of the partisan fighters and is a subject close to my heart, ‘Ay Carmela’ is a song of the Spanish anarchists again a subject I find politically relevant in these dark days of creeping right-wing hysteria. The Appalachian tunes have got a real charm to them, European folk with blues and Creole influences. I first heard ‘Deep Sea’ on a folk radio station called WUMB and loved it straight away. ‘Poor Liza Jayne’ was something the fiddler David Garner played me and I locked myself away and learned how to pick it in my newly discovered DADGAD tuning, an achievement I was very proud of! There are a number of originals on the album. ‘Winter Mist’ is a tribute to the road protesters of the 90s, and to Old Mick, a Claremont Road M11 activist who was burned on a funeral pyre in Lyminge Forest in Kent. Elsewhere we get almost mythologised visions of the English landscape in ‘I Choose the Road’ with its talk of ‘green hills in the distance / calling me home’ and ‘Ridgeway Downs’ describing gatherings ‘under the Solstice sun’. Thematically it’s very much in line with earlier generations of back-to-land idealists, the folk revivals of the 60s and 70s, the hippies and the punks. Nothing new, but a strong link in the chain. It has been challenged throughout time (see below for an example) and as long as there are free thinkers and people who refuse to be dictated to it will continue to be questioned and resisted. It’s a preposterous notion that people whose ancestors were thieves and murderers and are often thieves and murderers themselves have earned some kind of historical right to lord it over the rest of us. Anyone with half a brain cell can see that. Nothing radical about that, just plain sense. A tiny little cove that’s never that busy, only catches the sun in the morning. If you walk from there along the South West coastal path towards Teignmouth you’ll have views east all the way to the Jurassic Coast. 2. 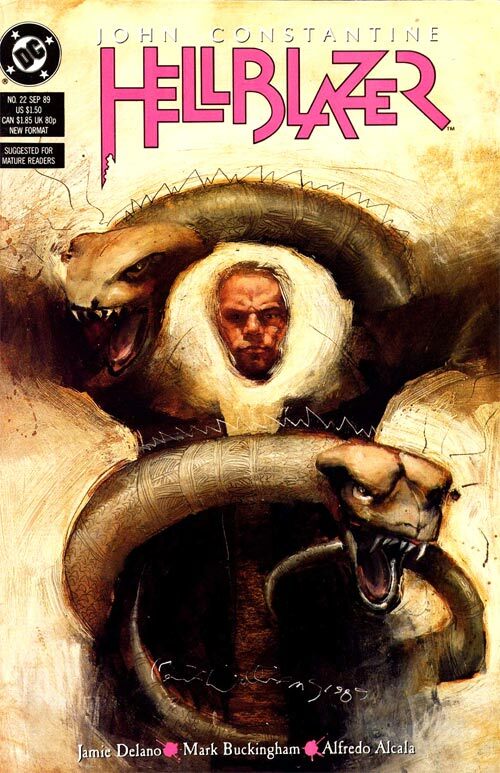 The Hellblazer book most worth tracking down in regards to this piece is ‘The Fear Machine’ by Jamie Delano and much of Paul Jenkins’ run too. Gary Budden is co-founder of independent publisher Influx Press and assistant fiction editor at Ambit magazine. He lives in London. Click here to read his blog: New Lexicons. Interesting piece Gary. I’d throw The Men They Couldn’t Hang into the mix as well. The same brew of punk, folk, landscape and sense of place, and radicalism. And maybe Hawkwind are the Daddies of them all, albeit with added space rock stylings. You’re right about bloody Mumford & Sons – the problem there is they are part of the new ‘posh boys looking for something real and authentic but never feeling it’ movement. Agree completely. I could have mentioned Men They Couldn’t Hang, Flogging Molly, Blood or Whiskey, Greenland Whale Fishers…the list is massive. I was running out of space! Hawkwind and all the prog and folk-revival stuff was way too big a subject to fit in. If you read the full interview on my blog, Jay talks about the influence of Traffic, Fairport Convention etc etc and how it all ties in with in what I’ve discussed here. Great post, I hadn’t heard the later Oi Polloi stuff – had always thought of them as sub- Rejects Gary Bushell territory. The landscape punk connection always felt completely natural to me, right from seeing Crass play back in the early 80’s there was always a strong spiritual/ rural element to the work. It’s out of that anarcho punk festival traveller crossover that you get fantastic and influential bands like The Tofu Love Frogs – largely undocumented and unrecorded but key at any free festival celebration of the nineties, often alongside champions of the road protests Tragic roundabout. I seem to remember an acapella cover of Do they owe us a living? 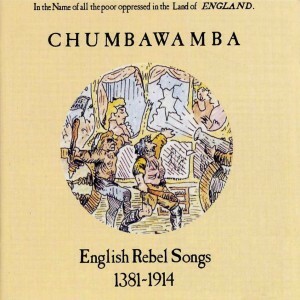 & also on stage jamming with Blyth Power..
As for Cumbawamba I think you’re a little unfair, they made some duff records (especially mid career..) but also some fabulous ones, their last few semi-acoustic albums are definitely worth getting hold of.